These words from the late Trappist monk Thomas Merton once greeted visitors to a barn in Monroe County, Michigan, that had been set apart as a place of quiet and prayer. The barn was closed a few years ago and has since been razed, but I thought of the sign on the door recently as I was reflecting on those among us who cannot live without constant sound. In their cars, they must have the audio system playing, and at home, the TV is always on, sometimes even as they fall asleep. In talking with friends who live or spend time with such people, I have pondered why this is so and, indeed, why all of us are uncomfortable with silence at times. Silence, as Merton suggested, does shine a light onto who and what we are, showing us things we would rather not see or consider. But perhaps it is just as true that our fondness for noise and stimulation is rooted in our fear of the seeming nothingness of silence and stillness – the vast abyss that looms before us when our tools and toys are set aside or turned off. The sheer magnitude of the quiet unsettles us and so we rush to fill it with something – anything – that can momentarily distract us and assuage our discomfort. When blogger Kim Smith (NatureIsMyTherapy.com) wrote recently about her quest for more stillness and her struggle with distractions, she cited a piece in the Utne Reader on “The Lost Art of Doing Nothing.” In it, Christian Williams talks about “losing the ability to sit and do nothing” because he, like everyone around him, now habitually turns to a smart phone to fill down time. In urging us to “spend more time staring into space rather than into a screen,” he suggests that silence and stillness are breeding grounds for new ideas and solutions. I would add that being still is not so much a state of nothingness as a canvas ready to receive a different design or even a moment of delight. Silence is really a preparation, a cleansing, a clearing of the ground for something new or better that we will never hear or see if we constantly fill in the background with noise or stimulation. Some friends who have recently gone on silent retreats engage in this kind of purging when they agree to refrain from speaking, except to pray out loud or meet privately with a retreat leader. This discipline has a purpose: so they can hear the still, small voice of God that is often drowned out by the clamor of our lives. 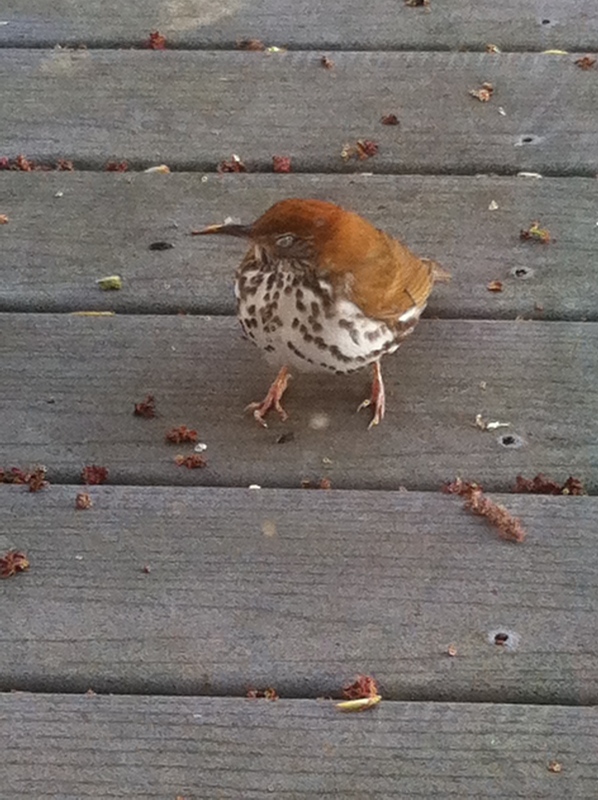 The other morning, as I was waking, I heard a wood thrush singing outside. It is a sound I typically hear earlier in the spring and so I wasn’t especially listening for it, but the conditions were right: the window was open, the clock-radio was set for prime bird-singing time, and when it did go off, it was not blaring, but set to play gentle music at a low volume. I was also able to hear and enjoy this bird’s reedy song because I had made space to listen to and identify it some years ago. One spring evening, I followed the sound through the woods, eventually training my binoculars on its source and pairing the wood thrush I saw with the splendid sound I had been hearing. Had I not stilled myself and carved out some times of quiet to become an observer of birds, I would have missed this auditory treat, part of a rich feast of bird song available to anyone willing to listen and experience the enrichment it brings to life. This is just one example, but in offering it, I mean to say that those who master silence and stillness lead lives that are anything but hollow. They may not have filled their minds, eyes, and ears with a panoply of ready stimuli that form the stuff of social chatter, but having confronted and engaged the seeming emptiness of silence and the initial discomfort it brings, they hear and see what so many miss – another layer of life that lies beyond and above the pressing business of what we call living. “We live in an age of noise.” Some years ago, a tall, quiet, and rather austere man spoke those words on New Year’s Day to a group of people gathered in a small inner-city church. When I met the man who spoke that day, I was a newspaper reporter doing an article about his church. As I got to know him better in later years – and became a member of his parish – he would say in his wry way, “Judy, write me a nice obituary.” After I left my newspaper job, I regretted that I would not have that opportunity. However, when he died last week, it occurred to me that this blog would be a fitting place to honor him by writing a little about the reservoir of quiet that was his life. At his funeral, it was said he had been a private person with few friends. Yet, as was evidenced by the attendance, many people were drawn to him, not because he was the proverbial “nice guy,” but because of something magnetic at his core – a steely resolve that made him just a little hard-headed at times and allowed him to speak truths that were not always comfortable to hear. In speaking and preaching, he was a master of brevity and economy, crafting simple, pithy sermons that sent listeners home with a thought to ponder or an action to take. He believed in conveying whatever he had to say in seven minutes. “Anything more, put it in the bulletin,” he counseled a deacon who spoke at his funeral. Still, he packed much wisdom into that short span of time and his New Year’s Day sermon on silence was a perfect illustration. The message he spoke that day obviously came from someone who was acquainted with silence and made room for it in his life. Lamenting that we had come to a place in our culture where “even our computers have speakers,” he said we don’t appreciate what can happen in silence. He suggested taking 15 to 20 minutes a day to be silent and to listen to the voice of God – a sound he said is easily drowned out by noise. At the church where the man I am writing about served, a sign on the inside door asks those who enter to remain silent. The worship services there are on the quiet side with very little in the way of announcements or spoken exchanges between people – that is, until after the service ends and everyone spills outside. Because of what happens inside, however, going there is truly a respite from the madness that often marks our lives and an opportunity to focus on something bigger than ourselves. My husband and I were drawn to this place precisely because of the quiet – and the quiet man – we found there. 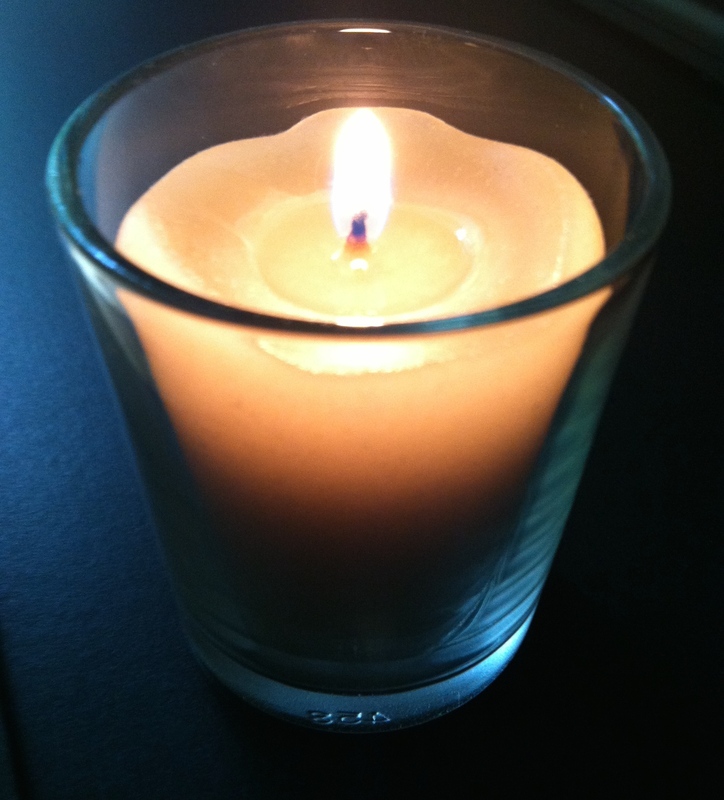 He is gone now, but the lessons he taught that New Year’s Day – and in his simple, uncluttered life – endure. He was able to still himself to listen to the voice of God and let it guide his thoughts, his words, his silence, and his actions. Encountering him left you wanting the peace he possessed. Thankfully, he left instructions. Some of the most serene people I know have a habit of being quiet at home. Whether they live alone or with other people, these souls seem to prefer and practice living without the constant background noise that pervades many of our dwellings. One such person rises each morning and makes it a point not to turn on the radio or television while getting ready for her job in a busy, production-driven office. Another who is at home during the day also keeps the radio and TV off, lets an answering device catch most of her phone calls, and, if she does play music, chooses soothing chants. For these quiet-keepers, the stretches of silence and stillness in their lives spill over to those they meet. Despite whatever stress threatens to disturb their peace, both manage to convey a sense of repose in which they are receptive and willing to listen to people. In conversations, they do not interrupt or finish sentences. They ask questions that reflect a genuine interest in the other person. Being in their presence is peaceful and affirming. Such people are models for me as I seek to live more quietly, yet struggle with a temperament that is more prone to jumpiness than calm. (My quiet mother lamented throughout my early life that I was in “perpetual motion.”) My profession did little to settle me down, thrusting me into an atmosphere of nearly constant stimulation that fed those natural tendencies. Today, removed from that setting, I sometimes still find it challenging to maintain quiet while working out of my home. In that, I do not seem to be alone. Increasingly, it seems, many of us think we need some kind of ambient noise to be productive and creative whether it’s music or an app like Coffitivity, which delivers the sounds of a coffee shop to our computers. Coffitivity, by the way, claims research shows that ambient noise, like the sound mix of “calm and commotion” found in a coffee shop, can aid creativity. I have written with some success in such settings, yet I find value in silence. So for me, instead of giving in to the impulse to break it by introducing sound, I am working on developing more of a taste for quiet. Rather than turn to electronic sound or even the kind of visual noise the Internet offers with its insistent invitations to look at a picture, video, or the latest trend, I am challenging myself to accept and live with the discomfort silence sometimes brings. In the 40-day season of Lent, which began this week, I am joining others who are fasting by unplugging some of their media connections to admit more silence into our noisy, distracted lives. Unsettling though this can be, I am hopeful that, as I experience the hunger of silence, I will begin to cultivate a mind and spirit that is less cluttered and more receptive to the gentle whispers I fail to detect when I stuff myself with the junk food of noise and information.